Presentations, documents & data (password protected). How do changes in ice cover, permafrost and UV radiation impact on biodiversity and biogeochemical fluxes in the Arctic Ocean? Understanding how biodiversity and biogeochemical fluxes are controlled by light penetration of the ocean and how they are affected by ongoing changes of the climate in the Arctic is the overall goal of the Malina project. The focus is set on three processes - primary production, bacterial activity and organic matter photo-oxidation - that play a major role in the organic ⇔ inorganic carbon fluxes. 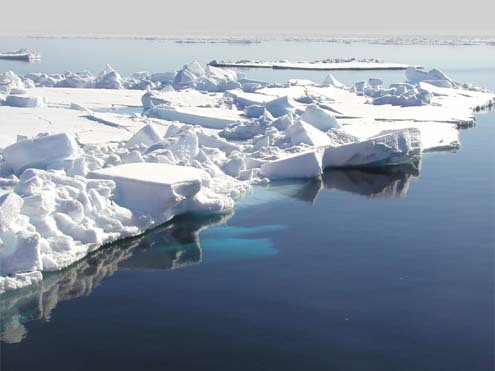 Thus the general objective is to determine the impact of climate change on the fate of terrestrial carbon exported to the Arctic Ocean, on photosynthetic production of organic carbon, and on microbial diversity. The Malina project was launched in fall 2008 and will be active for the next four years studying the southern Beaufort Sea and the shelf adjacent to Mackenzie river outlet. The field component of Malina will be undertaken in the area during the summer/ early fall 2009. Copyright © 2008 Laboratoire d'Océanographie de Villefranche.